Welcome to the Barnes Ranch webpage! My name is Justin Barnes, I live in Grant, AL and have been breaking, training and tuning barrel racing horses for over 15 years. At a young age I worked with several horse trainers of different disciplines to learn the correct way to build a foundation with starting a colt and also training barrel racing horses. My focus is set on barrel racing futurities, I feel like this is the most challenging area of competition in the barrel racing industry. Our operation is small but the quality of the prospects and performance horses that I have are quality individuals. Through the years I have sold horses across the U.S. and Canada. Each customer has helped to build my business by advertising my services to others in the horse industry. 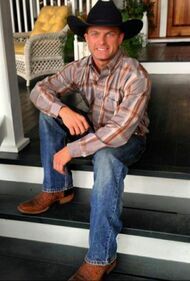 I was also blessed to be cast on the reality show Sweet Home Alabama, Season 4 by CMT which has helped me to better establish the Barnes Ranch brand. These few experiences along with many others has put me on the path to evolve the Barnes Ranch brand into what it is today. Please call or email me if you are interested in any of the services that I offer.